Combining two leading products, UDA ConstructionSuite Pro offers an enhanced system for project and contact management. 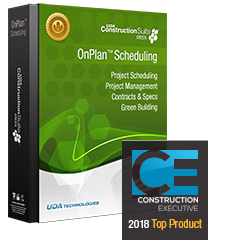 With upgraded Estimating, Scheduling, QuickBooks Integration, Contracts, and the all new Items Database, Integrated Calendar, Resource Allocation, and ConstructionNet CRM, UDA ConstructionSuite Pro delivers the next step in total information control. TotalCare Select Optional TotalCare Coverage ---------------------------- Basic Support (30 Days Phone & 1 Year Email Support) ............................. TotalCare Options (Priority Phone Support, Online Training, and Upgrades) Monthly TotalCare Plan - Single License - Add $39.99 per month Prepaid 12-Month TotalCare Plan - Single License - Add $299 per year ............................. Monthly TotalCare Plan - 2-3 Licenses - Add $69.99 per month Prepaid 12-Month TotalCare Plan - 2-3 Licenses - Add $599 per year ............................. Monthly TotalCare Plan - 4 Licenses - Add $99.99 per month Prepaid 12-Month TotalCare Plan - 4 Licenses - Add $899 per year .................................................................................................................................................................................... NOTE: Monthly TotalCare Support and Membership Plans are billed monthly and can be discontinued at any time. Prepaid TotalCare service will bill monthly after the first year.